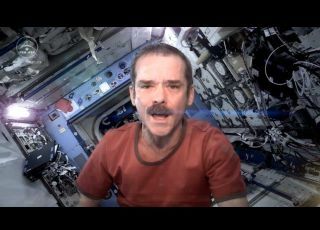 Canada's astronaut star Chris Hadfield wowed the Internet last year when he posted a YouTube music video of David Bowie's epic "Space Oddity" while actually living in space. Now, the astronaut says, the one-year copyright permission that allowed him to post the video is expiring, making today (May 13) the last day it will be available on YouTube. "Bowie's last day - we had permission for a year, so our Space Oddity video comes down today. One last look:http://www.youtube.com/watch?v=KaOC9danxNo …" Hadfield wrote via Twitter (@Cmdr_Hadfield) today. Music and sound was one of the hallmarks of Hadfield's space mission in 2013. He launched to the International Space Station on Dec. 19, 2012 and returned to Earth the following year on May 12. During that time, he played the guitar, posted a series of how-to videos on life in space, and became Canada's first space station commander. He also recorded a series of everyday sounds to share what it sounds like to live on the space station. Hadfield also gained pop star status while living in orbit by using social media to post spectacular photos of Earth from space, videos of weightless living, and mission updates. He also traded tweets with William Shatner, of "Star Trek" fame, and other Trek stars. After returning to Earth, Hadfield " and later retired from the Canadian Space Agency's astronaut corps in June 2013, and later wrote an autobiography, "An Astronaut's Guide to Life on Earth."